This was a great help. Thank you very much. Back to the vise! I'm addicted to fly-tying...road kill will never be the same. I loved the tutorial, however I cannot see the pictures for some odd reason. 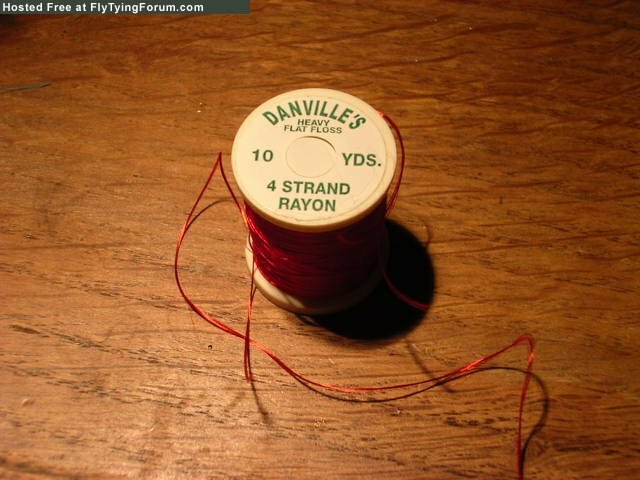 I've received an email from Class Fly tying to say that you have a message for me regardng floss silks which I use and supply. Can you send me the message in pm? I do not remember the question, and that would refresh my memory. Hope that helps jog your memory. I cannot see the pictures in this Post any suggestions. if you visit the website www.fritillary.co.uk you will see a page dedicated to fly tying which shows coloirs of floss silk to use when making floss bodies and also a virtual gallery of flies tied with the floss silk that we use - available in 41 colopirs altogether. Pam, I must of wanted to know where to get a source in the USA. I cannot think what else I would of asked at this time. Our floss silks are manufactured in the UK and we do not have a distributor/wholesaler or retailer in the USA. sorry. However, we supply lots of fly fishermen in the US as we can despatch by airmail usually within 24hrs & you would normally receive the silks in 4/5 days. Prices and details can be found on www.fritillary.co.uk. If you need to convert to US$ please use the currency calculater website. Please do come back to me if you need any further info. Thank you Pam. I will keep that in mind when I need some more of that type of material. I am starting to do soft hackles with floss and silks...but I haven't tied much the past month. If it would help I could send you a few small samples to show colour and the denier which is very fine at 90. Just email me your address & I'll get them in the post to you. the way it is in the original post it has the beging part twice. You can see exactly what I mean if you right click on the red X where the picure should be and then click on properties. It would be really nice of a mod could fix it I would like to read the OP as it was intended to be read.